ISLAMABAD — Allegations by Afghanistan's president that the recent suicide attack on the country’s spy chief was planned in neighboring Pakistan have raised bilateral tensions before key talks between the presidents of the two countries Tuesday in Turkey. The assassination attempt is seen as a setback to efforts to reconcile with the Taliban insurgency and negotiate an end to the decade-old Afghan war. Afghanistan Chief of National Directorate of Security Asadullah Khalid is under treatment at a U.S.-run military hospital near Kabul, after surviving Thursday’s assassination attempt in Kabul. Afghanistan's Intelligence Chief Asadullah Khalid speaks to the media in the Arghandab district of Kandahar province, June 20, 2008. ​A suicide bomber posing as a peace messenger reportedly caused severe injuries to the Afghan spymaster. Without directly pointing fingers at Pakistan, Afghan President Hamid Karzai said Saturday his country “knows for a fact” the assassination was planned on Pakistani soil. Islamabad quickly rejected the claim and urged Kabul to share evidence with Pakistan before leveling any charges. He said Afghans are “100 percent sure the assassin came to Afghanistan from the Pakistani city of Quetta.” But he said it would not be appropriate to make further comments on the issue until the investigation is complete. President Karzai travels Tuesday to meet with his Pakistani counterpart, Asif Ali Zardari, for talks hosted by Turkish President Abdullah Gul. The meeting is aimed at encouraging Pakistan and Afghanistan to strengthen cooperation against extremism. 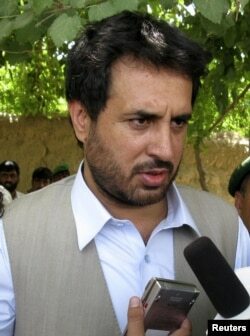 The Afghan president has indicated the attack on his intelligence chief will be part of the talks. "We will be having discussions in Turkey. But of course will be seeking a lot of clarifications from Pakistan and asking for information [about the attack] that they may have,” he said. Officials said before he was wounded intelligence chief Khalid was to travel to Turkey to assist his president in talks with Pakistani leaders. Afghan and American officials have long alleged the Taliban leadership war council, which runs much of the insurgency in Afghanistan, is based in the Pakistani city of Quetta. Pakistani officials deny the presence of what is widely referred to as the “Quetta Shura” of Taliban leaders. Speaking to VOA, Provincial Home Secretary Akbar Hussain Durrani said if the United States or any other country has solid evidence it should be shared with Pakistan. The Taliban has claimed responsibility for the attack on intelligence chief Khalid, the fifth attempt on his life within five years. The latest attack came days after Pakistani and Afghan officials reported progress in their joint efforts aimed at promoting political reconciliation with Taliban and other insurgent groups to seek an end to the war in Afghanistan. The negations between Kabul and Islamabad led to the release of at least 10 Afghan Taliban leaders who were being held in jails in Pakistan. The Pakistani government has promised to release dozens of such prisoners for their repatriation to Afghanistan, where officials believe these men can help persuade other insurgents to join the political reconciliation process. Despite the attack, President Karzai has vowed to pursue dialogue with Pakistan to promote the Afghan reconciliation process.